Well, there was an earthquake about 6 hours ago in Burma. This M 6.8 earthquake was rather deep, which is good for the residents of that area (the ground motions diminish with distance from the earthquake hypocenter). Here is the USGS website for this earthquake. 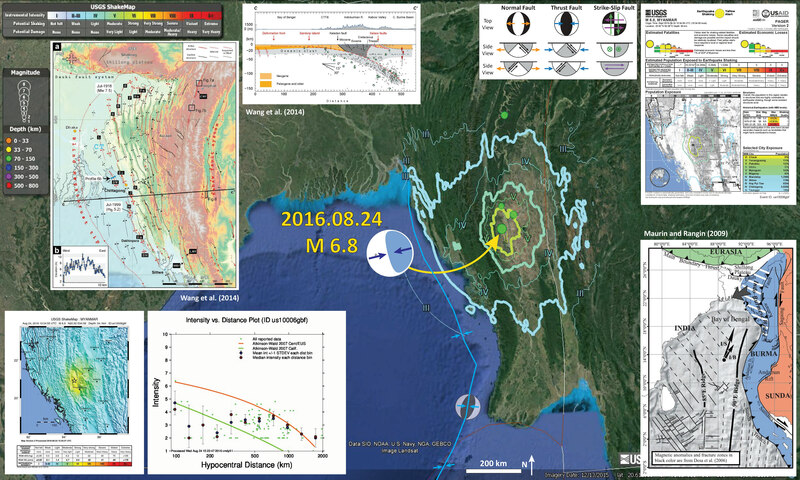 This M 6.8 earthquake is possibly soled in the convergent plate boundary thrust fault at the base of the Indo-Burmese Wedge (see maps below). While this M 6.8 earthquake probably won’t result in a large number of casualties, there are reports of damage to buildings and temples. Some live updates on damage in this area are posted here. Below is my interpretive map that shows the epicenter, along with the shaking intensity contours. These contours use the Modified Mercalli Intensity (MMI) scale. The MMI is a qualitative measure of shaking intensity. More on the MMI scale can be found here and here. This is based upon a computer model estimate of ground motions, different from the “Did You Feel It?” estimate of ground motions that is actually based on real observations. I include some inset figures and maps. I also post some of these figures below, along with their original figure captions. In the upper right corner I include the Rapid Assessment of an Earthquake’s Impact (PAGER) report. More on the PAGER program can be found here. An explanation of a PAGER report can be found here. PAGER reports are modeled estimates of damage. On the top is a histogram showing estimated casualties and on the right is an estimate of possible economic losses. This PAGER report suggests that there will be quite a bit of damage from this earthquake (and casualties). In the lower right corner, is a map from Maurin and Rangin (2009) that shows the regional tectonics at a larger scale. In the lower left corner is a map that shows an estimate of the ground motions from a hypothetical earthquake of this magnitude in this location. This shows the shaking intensity and uses the MMI scale mentioned above. The plot to the right shows the reported MMI intensity data as they relate to two plots of modeled estimates (the orange and green lines). These green dots are from the USGS “Did You Feel It?” reports compared to the estimates of ground shaking from Ground Motion Prediction Equation (GMPE) estimates. The relations between ground shaking and distance to an earthquake are also known as attenuation relations as the ground motions diminish (get attenuated) with distance from the earthquake. In the upper left corner is a map from Wang et al. (2014) that shows even more details about the faulting in the Indo-Burmese Wedge (IBW) shown in the Maurin and Rangin (2009) map. To the right of this map is a cross section (c-c’ shown on the map) that shows an east-west transect of earthquake hypocenters (Wang et al., 2014). On 2016.04.13 there was a shallower earthquake in this region of Burma, however it was a strike slip earthquake. Here is my earthquake report for that M 6.9 earthquake. On 2016.01.03 there was another strike-slip earthquake in this region. Here is my earthquake report for that M 6.7 earthquake. Here is the Curray (2005) plate tectonic map. Here is a map from Maurin and Rangin (2009) that shows the regional tectonics at a larger scale. They show how the Burma and Sunda plates are configured, along with the major plate boundary faults and tectonic features (ninetyeast ridge). The plate motion vectors for India vs Sunda (I/S) and India vs Burma (I/B) are shown in the middle of the map. Note the Sunda trench is a subduction zone, and the IBW is also a zone of convergence. There is still some debate about the sense of motion of the plate boundary between these two systems. This map shows it as strike slip, though there is evidence that this region slipped as a subduction zone (not strike-slip) during the 2004 Sumatra-Andaman subduction zone earthquake. I include their figure caption as a blockquote below. Structural fabric of the Bay of Bengal with its present kinematic setting. Shaded background is the gravity map from Sandwell and Smith . Fractures and magnetic anomalies in black color are from Desa et al.. Dashed black lines are inferred oceanic fracture zones which directions are deduced from Desa et al. in the Bay of Bengal and from the gravity map east of the 90E Ridge. We have flagged particularly the 90E and the 85E ridges (thick black lines). Gray arrow shows the Indo-Burmese Wedge (indicated as a white and blue hatched area) growth direction discussed in this paper. For kinematics, black arrows show the motion of the India Plate with respect to the Burma Plate and to the Sunda Plate (I/B and I/S, respectively). The Eurasia, Burma, and Sunda plates are represented in green, blue, and red, respectively. Wang et al. (2014) also have a very detailed map showing historic earthquakes along the major fault systems in this region. They also interpret the plate boundary into different sections, with different ratios of convergence:shear. I include their figure caption as a blockquote below. Simplified neotectonic map of the Myanmar region. Black lines encompass the six neotectonic domains that we have defined. Green and Yellow dots show epicenters of the major twentieth century earthquakes (source: Engdahl and Villasenor ). Green and yellow beach balls are focal mechanisms of significant modern earthquakes (source: GCMT database since 1976). Pink arrows show the relative plate motion between the Indian and Burma plates modified from several plate motion models [Kreemer et al., 2003a; Socquet et al., 2006; DeMets et al., 2010]. The major faults west of the eastern Himalayan syntax are adapted from Leloup et al. and Tapponnier et al. . Yellow triangle shows the uncertainty of Indian-Burma plate-motion direction. Here is a map from Wang et al. (2014) that shows even more details about the faulting in the IBW. Today’s fault occurred nearby the CMf label. I include their figure caption as a blockquote below. Wang et al. (2014) found evidence for active faulting in the form of shutter ridges and an offset alluvial fan. Shutter ridges are mountain ridges that get offset during a strike-slip earthquake and look like window shutters. This geologic evidence is consistent with the moment tensor from today’s earthquake. There is a cross section (C-C’) that is plotted at about 22 degrees North (we can compare this with the Maurin and Rangin (2009) cross section if we like). Figure 6. 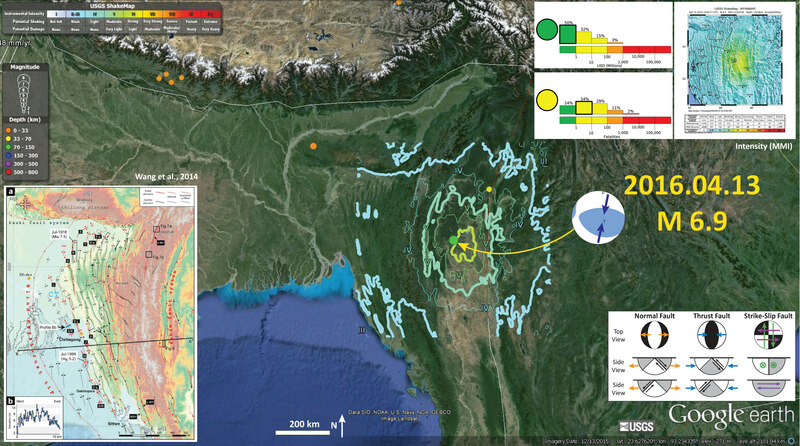 (a) Active faults and anticlines of the Dhaka domain superimposed on SRTM topography. Most of the active anticlines lie within 120 km of the deformation front. Red lines are structures that we interpret to be active. Black lines are structures that we consider to be inactive. CT = Comilla Tract. White boxes contain the dates and magnitudes of earthquakes mentioned in the text. CMf = Churachandpur-Mao fault; SM = St. Martin’s island antilcline; Da = Dakshin Nila anticline; M= Maheshkhali anticline; J = Jaldi anticline; P = Patiya anticline; Si = Sitakund anticline; SW= Sandwip anticline; L = Lalmai anticline; H = Habiganj anticline; R = Rashidpur anticline; F = Fenchunganj anticline; Ha = Hararganj anticline; Pa = Patharia anticline. (b) Profile from SRTM topography of Sandwip Island. Here is the Wang et al. (2014) cross section. I include their figure caption as a blockquote below. Schematic cross sections through two domains of the northern Sunda megathrust show the geometry of the megathrust and hanging wall structures. Symbols as in Figure 18. 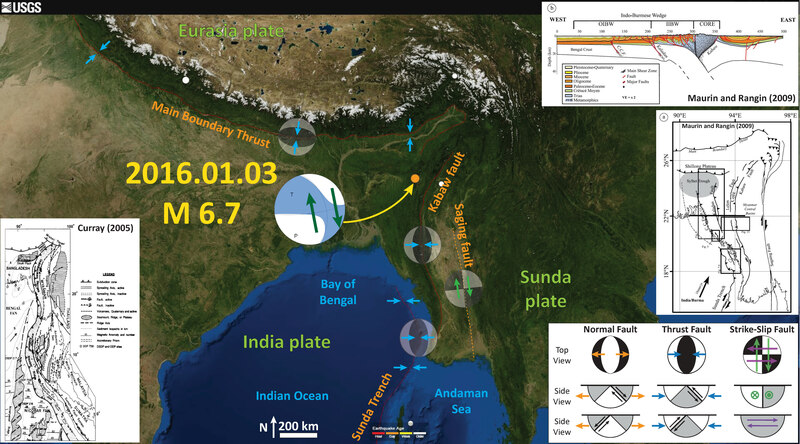 (a) The megathrust along the Dhaka domain dips very shallowly and has secondary active thrust faults within 120 km of the deformation front. See Figures 2 and 6 for profile location. Here is a different cross section that shows how they interpret this plate boundary to have an oblique sense of motion (it is a subduction zone with some strike slip motion). Typically, these different senses of motion would be partitioned into different fault systems (read about forearc sliver faults, like the Sumatra fault. I mention this in my report about the earthquakes in the Andaman Sea from 2015.07.02). This cross section is further to the south than the one on the interpretation map above. I include their figure caption as a blockquote below. Present cross section based on industrial multichannel seismics and field observations. The seismicity from USGS catalog and Engdahl  is represented as black dots. Focal mechanisms from Global CMT (http://www.globalcmt.org/CMTsearch.html) catalog are also represented. Here is a cross section that shows seismicity for this region. The earthquakes are plotted as focal mechanisms. This comes from Jacha Polet, Professor of Geophysics at Cal Poly Pomona. Here is a map showing the seismicity and focal mechanisms, also from Jacha Polet. Curray, J.R., 2005. Tectonics and history of the Andaman Sea Region in Journal of Asian Earth Sciences, v. 25, p. 187-232. Wang, Y., K. Sieh, S. T. Tun, K.-Y. Lai, and T. Myint, 2014. Active tectonics and earthquake potential of the Myanmar region in J. Geophys. Res. Solid Earth, 119, 3767–3822, doi:10.1002/2013JB010762.